Before the boom of YouTube tutorials and nascent of Instagram, makeup sold at your local beauty supply store carried a very icky stigma. Viewed as low-quality and for the type of girls that wore foundation disturbingly different from their décolletage; there was almost never a good (enough) reason to resort to makeup there. But within the last two years or so, brands sold almost exclusively at the beauty supply store have stepped up their game up and in a major way. They’ve improved so much that they are nearly competing with the beauty industry’s most prominent labels! Beauty bloggers and rising makeup artists, have also contributed to the business re-births and acceptance of beauty supply and online-only brands. In declaring their “holy grail” products to their followers (whether it’s to achieve a lust-worthy contour or a mean eyebrow lift) they are the same fervid consumers of the beauty industry. In return, they directly inspire companies to unveil more products and innovative selections. The rise of the beauty supply store and brands discovered on Instagram definitely evolved when higher end labels and those sold at the drugstore were a bit slow in responding to the bubbling trends of beauty addicts. A “Mid-range” one like Urban Decay were the first to truly capitalize on the all-encompassing eyeshadow palettes. And the $10 and under brands sometimes initiated the obsessions themselves. The first beauty supply store brand to really break the makeup counter was the product “PRO Concealer” by the once forgotten, L.A. Girl. Unlike most brands when it comes to face makeup, PRO Concealer contained an impressive and necessary range of skin hues that sent women of color blowing air kisses to the Gods. Every in-between shade of brown was available through PRO. Not even *Cover Girl and L’Oreal, with their ambassadors of Janelle Monae and Liya Kedebe, could say the same. Only M.A.C., Make Up For Ever and CoverFX could really respond to L.A. Girl with a smug smile. PRO Concealer was even beloved by pale/White makeup wearers who loved it for contouring. Makeup users hadn’t been this excited to rush to to the beauty supply store since the craze of O.P.I.’s Shatter top coat. (I was so desperate for one of those that days of searching for it, I finally found one, in black, after only hearing “sold out!” This store was overcharging at $14.99. I bought it on the spot). *Yes, Cover Girl has the Queen Collection, backed by Queen Latifah. But their main line often maintains just one or two brown shades. And the Queen Collection is not sold everywhere. What has worked in favor of the beauty supply store brand is that they’re sometimes a lot more sensitive to the needs and shades of women of color. Again, when the BB cream craze hit, many notable labels stalled at an ashy looking taupe laughably called “Deep” or “Dark.” But brands like Ruby Kisses and Kiss NYC offered a sweet five shades of brown. After L.A. Girl kicked down the door for the little makeup brand to be used next to Lancome, others like Nicka K, Ruby Kisses, Palladio, Absolute and even NYX and E.L.F. joined in on the monomanias of BB and CC creams; matte lipsticks and lip stains. The momentum beyond CVS and Macy’s also affected brands usually only sold online such as Gerard Cosmetics, Coloured Raine, Dose of Colors, Lime Crime, ColourPop and Melt. The aforementioned all got a boost from consumers wanting options and product knowledge. The beauty business has experienced an intense surge of customer loyalty since the rise of the beauty blogger, their tutorials and social media. In 2012, AdWeek published a fun infographic about how social media had influenced sales. Four years before this article was written, AdWeek determined that they are 750+ “unique beauty brands” and that “blogs are 2x more likely to drive product purchases than magazines ads.” Most of us that love makeup and watch YouTube and read beauty sites, can definitely attest to that. I finally tried CoverGirl’s Queen Collection CC Cream not based on the pretty girl in the ad, but after I had watched IndigobluBeauty’s review of the product. I bought mine in “Sheer Espresso” the following day. Today, selfie-nation is just as eager to get the Jordana Matte lippies as they for the Anastasia brow pencils. And they can pick up lots of Red Cherry lashes for the price of one Velour Lashes set. Honestly, nobody was thirsty for (a brand like) Jordana anything not just two years ago, but ten years ago. But sometimes, still, you do get what you pay for. Like with any makeup item, always be aware of what works for you. That goes both financially and cosmetically. Like in the first photo above, most of those beauty supply/or Instagram brands I would buy again. 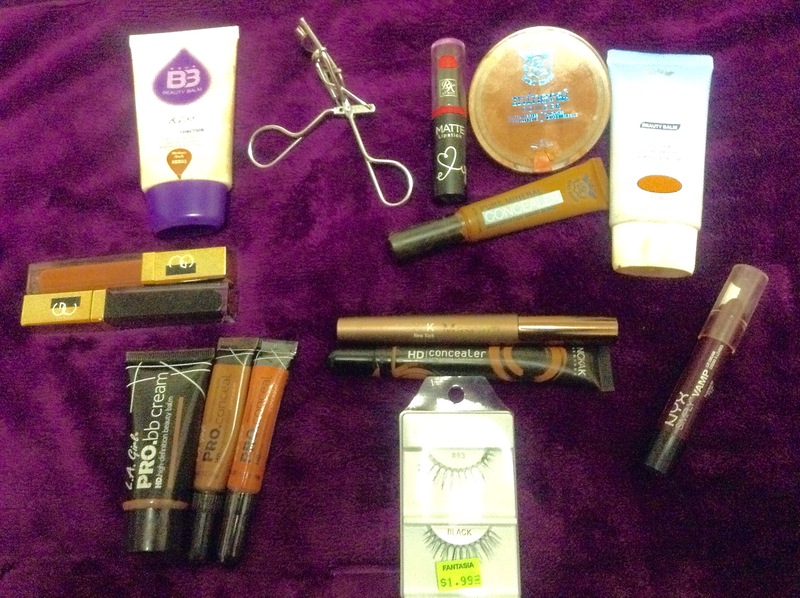 Except for the Nicka K mascara which was terribly stiff when dry. And that PRO BB Cream is fine, but is best used on skin that doesn’t need a lot of coverage. While not pictured, I did purchase and try L.A. Girl’s Glide Gel Eyeliner. For the first time ever, I was actually allergic to a makeup product. The color payoff was barely standard and in just a few hours, it was smudgy and fading. Your cat-eye won’t last and worse, my eyes were turned red. Out of the many beauty supply store brands those I’ve tried, some buy-agains will be Nicka K’s HD Concealer as a highlighter and under-eye. The texture of Gerard Cosmetics’ lipstick is just the right mix of creamy with a matte finish. And the LA Colors 3D Blush Contour Palette did not disappoint. Beauty supply store and “Instagrams labels” were smart to make the effort and deliver better or competent products. As consumers, it is refreshing to know that we don’t have to always spend a certain amount for a great product. Like fave of the beauty blogger world Dupe That shows, some of the most popular shades you can easily get for $5 instead of $24. Yet if you are truly a makeup aficionado, the thirst is never parched for cosmetics, whether its Jordana, Maybelline or Chanel. Are you brave enough to rock mint lips? 💚 Look at these amazing alternatives we found for Lime Crime's "Mint to Be." @colourpopcosmetics "Charm" is a total dupe! It's almost identical, having just a tad bit less shine to it. What do you think of this color? !